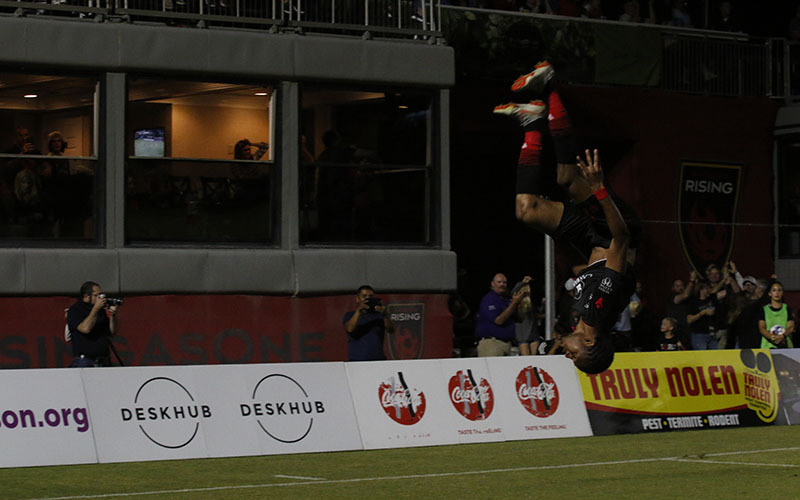 The Phoenix Rising beat the Swope Park Rangers to advance in playoffs. SCOTTSDALE – Some of Arizona’s top sports figures came to watch the hottest team in the state Friday night. They weren’t disappointed. 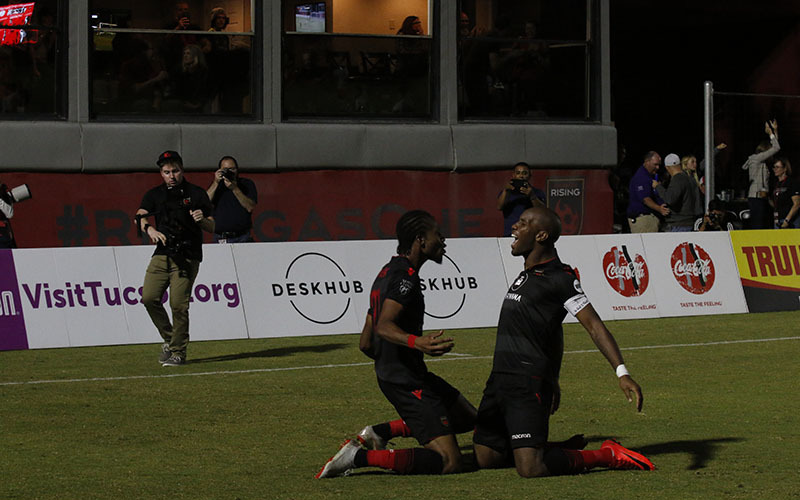 Phoenix Rising FC defeated the Swope Park Rangers 4-2 in the United Soccer League Western Conference semifinals in front of 7,707 fans at Phoenix Rising Soccer Complex. The crowd included the Cardinals’ Larry Fitzgerald and the Diamondbacks’ Archie Bradley, as well as Coyotes players, actor Frankie Muniz and Teddy, the 6-year-old whose story went viral recently after 32 classmates failed to attend his birthday party in Tucson. 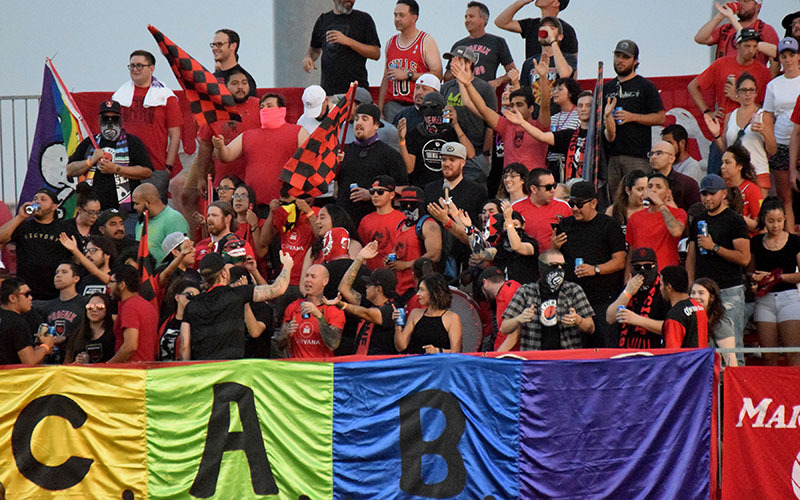 They watched as the second-division team secured its place in the USL Western Conference final in front of a record crowd. The first goal came courtesy of forward Jason Johnson, who chipped the ball between two Swope Park defenders in the 22nd minute and ripped a shot across goal into the bottom right corner. The excitement felt around the stadium would only last for three minutes. A familiar face tied the game for the Rangers. Forward Tyler Blackwood, a past player with Arizona United (the Rising’s previous name), quickly evened the score. Eight minutes later, Hadji Barry put Swope Park ahead 2-1, although the high-energy crowd seemed unfazed. 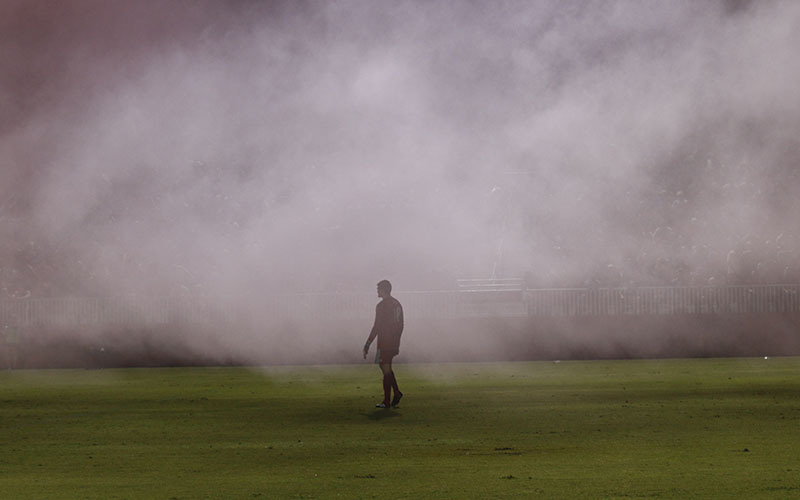 In the 33rd minute, Rising forward Chris Cortez gave the fans something to cheer about and made club history. Cortez scored Rising’s second goal, his 30th with the team and 18th of the season. Cortez is now the team’s all-time leading scorer, passing Long Tan. “Very happy to take the next step. Now it’s about enjoying the moment for a sec,” Cortez said. Cortez said he wasn’t thinking about his record when he scored, and said nobody would remember him setting a record if the Rising had been eliminated. “I’d much rather remember a championship than anything else,” he said. Midfielder Kevon Lambert scored the Rising’s third goal in a pinball-like play in the 48th minute, his third goal of the season. After Cortez intercepted the ball outside of Swope Park’s penalty box, the ball made its way to Jason Johnson, whose rebounded pass fell into Lambert’s possession. Lambert’s shot rebounded off a defender and went in after hitting the post. “It’s a really great feeling. I can’t even explain how I feel right now, to be scoring in this type of game,” Lambert said. Lambert said the Rising sat back, hoping for the Rangers to make mistakes, and later punished their rival. “We got the job done as usual,” he said. When the game clock hit the 90th minute, tension was palpable at the stadium. Rising players who weren’t in the starting 11 or part of the seven bench spots were eyeing the referee, anxiously awaiting the final whistle. Another goal was still to come. Didier Drogba added another chapter to his fairytale career, scoring the Rising’s fourth in added time. All the players, on the field and off, rushed to the corner flag and crowded Drogba. Rising coach Rick Schantz said the victory was just another successful step. Organization and communication were key to winning the game, Schantz said, since Swope Park was such a disciplined team. This season, the Rangers tied the Rising in Scottsdale and beat them in Kansas City. “I couldn’t ask more of the players,” said Schantz, who praised the sacrifices made by Lambert and Collin Fernandez. “I asked them to suffer and sacrifice for the team, and when they do that, we’re pretty good,” Schantz said. The fans also played a big role, said Schantz, who had asked his players to raise their hands and coax the crowd, since that energy changes the team. It was another successful step taken by a team that is in its second year of existence. Next for the Rising is the winner of Saturday’s game between Orange County SC and Reno 1868 FC. If Orange County wins, the Rising will play the conference final on the road. If Reno wins, it will host another home playoff game.